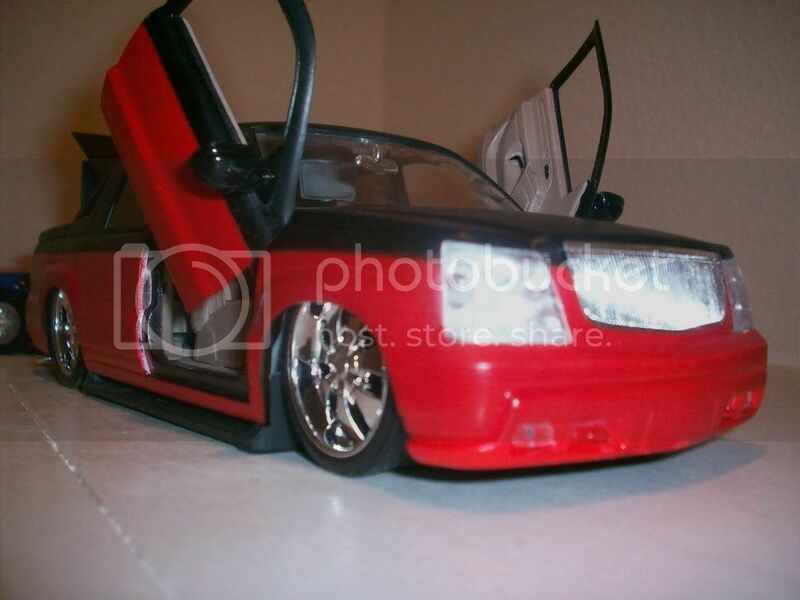 I was wondering how to make Lambo doors on a 1:24 scale model car. I want to make a model of a friends civic hatchback and he has lambo doors on it. Any tips, pics and suggestions are welcome and thank you in advance. Trial and error? i've never seen them scratch built before. i did buy that cadilac EXT kit that has what they call Scissor doors. i've got a pic of the truck but not a good one of the hinge. i could get one if you need it. It's only a mater of time before i see it done on this forum. Its not hard to do lambo doors actually. So far I have done them to two different models, the super stallion mustang and the 99 Silverado. The photos below does not show any detail on the hinge but the truck will soon be rebuilt. I will redo pretty much every part of the truck and build better hinges for it. If you want look for a build thread in the truck section called X-pearmint. This signature is dedicate to Private Jack Sweet whom was killed in Iraq . The 19 year old was a member of the 10th Mountain Division's 1st Brigade, 2nd Battalion, 22nd Infantry. We will never forget you. Car doors will be black with model of the every new mini truck which will modified with the color selection. With propel of the cars and models how to bestessays discount code we expect where every man is the rich can don’t want any discount.